More times than not anime and manga are thought to be interchangeable. Usually manga precedes anime and the latter is meant to be more of a promotional material than a stand-alone piece of art. The fans of the manga expect the adaptation to be as close to the source as possible, as far as just animating all the existent panels without any additions or omissions. Because of that a fundamental problem arises since manga can go on as long as a mangaka wishes whereas the anime adaptation just can’t extend over a fixed time. Sometimes a second season or some OVAs are the answer but not every anime can do that good to earn it. As this quite roundabout introduction makes clear, Dimension W is one of the shows that suffer from the exact problem. As it turns out, it isn’t the only flop, but outside of that there are some positives, too, albeit they are not so numerous. The premise of Dimension W may catch many an eye right on since in this day and age anime that doesn’t concern high-school or just teenagers is not that common. What else could you wish for, if not for some classic sci-fi with some new dimensions, robots and a cool looking protagonist? The start really looked promising – in the future some scientists somehow found another dimension and a way to harvest unlimited energy from it (sounds pretty dumb, but that’s not the end of it). The technology is monopolized, but as always, some illegal schemes are bound to show up. Enter our protagonist Kyouma Mabuchi, a gruff guy, who deals with these things for a living. During one of the operations, he finds an uncommonly well-made android Mira (well, it turns out we couldn’t escape teenage characters after all…) and those two unlikely companions wind up into some big business. Sounds good? Well, that’s when everything else comes up. As I already mentioned, pacing is not the strength of the show, as well as the composition. The first 3 episodes are pretty much a usual introductory stuff, with an almost-honorable thief called Loser introduced a bit randomly. Next 2 episodes contain one arc that could have easily extended over half the season – everything just happens without much explanation or meaning. I think this arc could have better been omitted rather that shrunk into this mad ride – it holds rather little significance to later events. All the rest of the episodes make up one large final arc when everything should come together and make sense. Would that it could. Still, the biggest problem probably is the Dimension W itself. 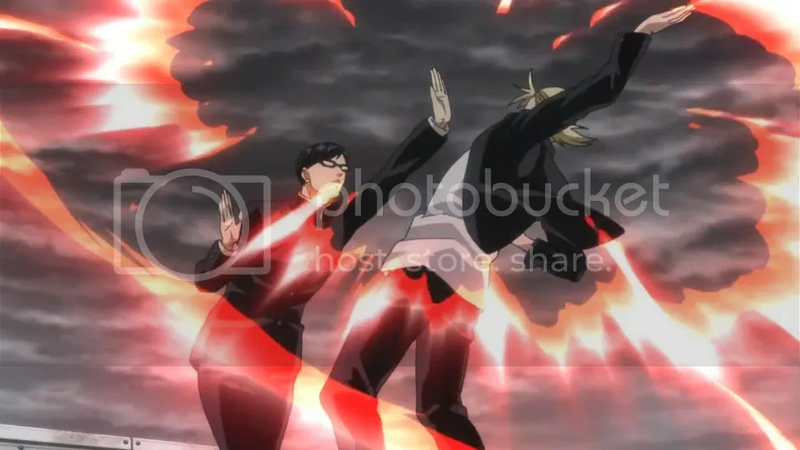 In each arc it works like a different thing, overall turning out to be able to construct some abominations that could easily belong behind the Gate of FMA, to make some alternative realities with ghosts and zombies, to entangle various concepts like dreams, souls, time and almost everything that can come up to mind. It’s pretty much omnipotent. Having something like that without any limitations makes for an excuse to pull various Deus ex Machina stuff, but that doesn’t make a believable and, above all, an interesting thing to watch. 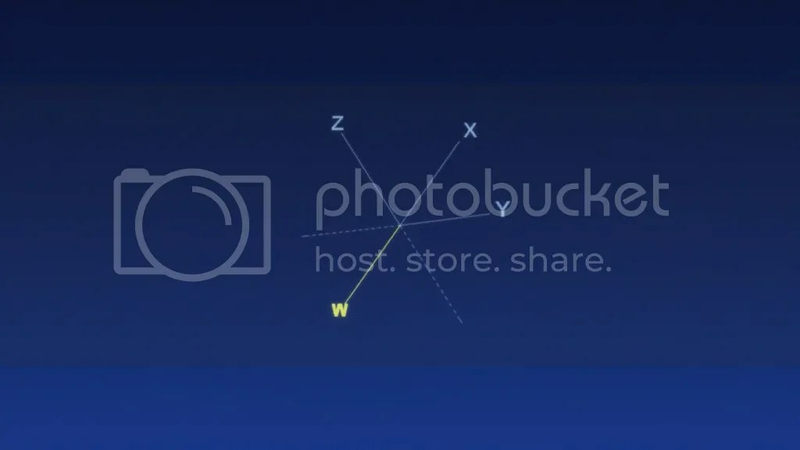 Not to mention the depiction of the Dimension graphically. Come on, do you really think that a negative X axis contains unlimited energy? All in all, it’s just a poorly constructed game with a toy that can do anything, and that becomes worst near the end of the series, when random characters are tossed in, various fights begin and end, people remember things, people do things, the Dimension does things, conveniences happen and, well, that’s a trainwreck. I believe I could rewatch everything for the sake of understanding every single action and motivation of the characters but I just don’t have the will to go through everything again and I’m not entirely sure that it will actually answer many questions. Moral of the story – go read the manga, kids. At least it should have a proper pacing. What is popular nowadays? Moe? Add Mira – check. What do people long for when they have seen enough moe? A badass guy that operates on the verge of law? Add Kyouma and – check. Actually there is hardly anything more to say about our two leads that could be positive. Mira is made to be cute, a bit clumsy and, of course, just has to become an object for some fanservice. Apart from quite memorable appearance, Kyouma isn’t the most original character, either. How can any cool character not have a dead girlfriend or convenient amnesia about some important past events whose absence would have probably saved much time for everyone – characters and the viewers alike. As a starting point all those characteristics are not that bad a thing – you must start somewhere. The worse part is that neither Mira nor Kyouma manage to advance their relationship the least bit – Kyouma still sees the android as a “pile of junk” after all the 12 episodes and she doesn’t really mind that. Supporting characters are plenty – just too plenty. Some of them have rather futuristic and flamboyant hairstyles and clothing (really, all the colors in the world does not make a show stylish), some look like they have hopped in form a wrong anime, but many of them are just not needed. Yes, manga probably manages to flesh them out more or less, but the anime just goes forward in full speed especially in the second half and just barely scratches any of 6 or 7 or I don’t even remember how many new characters that appeared at that time, but most of them barely say two words and virtually just steal screen time for no reason. When someone gets more spotlight, that doesn’t mean that we will get a decent character – I was unsure till the very end if Prince Salva was meant to be a relatable guy, some discarded protagonist or an up-jumped afterthought. Still, the main disappointment was due to the villain. A good story absolutely must have a villain, right? With a huge villainous smile, right? A mad scientist? Now we are talking. Well, he appeared near the end out of nowhere and looked very out of place. Not a Deus ex Machina bad a Villain ex Machina. A sci-fi premise should mean lots of futuristic city-scapes, cool gadgets and stuff, right? Not in this case. All the energy coil stuff is interesting, but the show just doesn’t show its (theoretically) strongest point – how society has changed with all this technology. 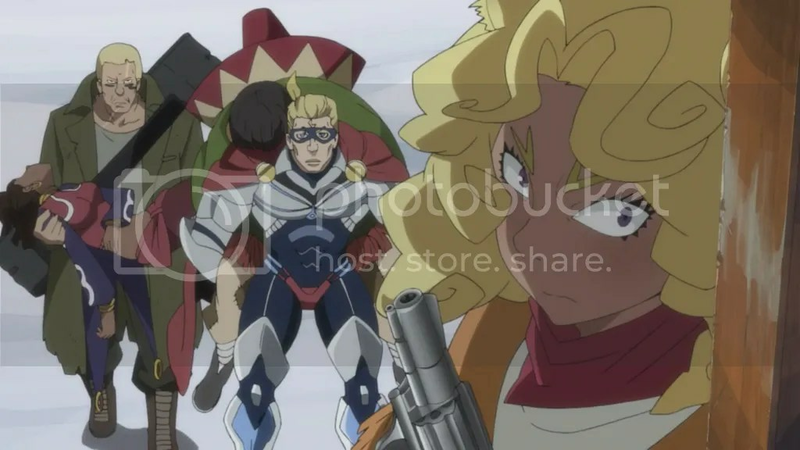 The futuristic environment factor is hugely underplayed and, to be frank, out of all the art form the Dimension W I would probably remember just Kyouma’s character design. Well, Loser’s also, but just because he’s just another character that looks to be in a wrong anime. The Easter Island makes a slight impression, but mainly because it’s just a refreshing sight to see some huge rocks instead of, say, a ghost house in a middle of a sea of mist. 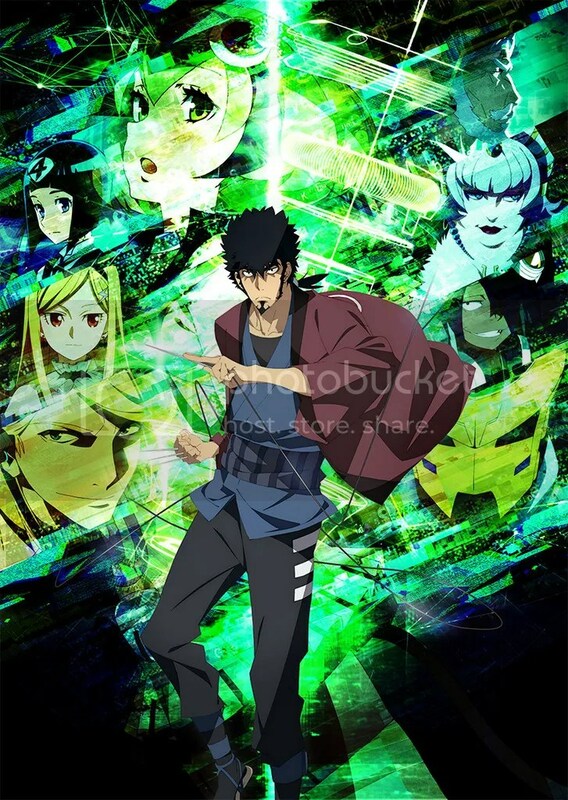 Dimension W is not the first anime whose soundtrack is one of the better parts of it. Done by not a single person – Go Shiina and Yoshiaki Fujisawa worked together – it provides some very diverse tunes that, when not overshadowed by visual information, work well with the scenes they are attached to. Sometimes when the story went overboard music really was factor to make me give the anime just another chance. It’s a good OST, but maybe not the great one. Yes, there are some very enjoyable and cool tracks, but there are also some instantly forgettable ones. If not this one, at least check some other of Go Shina’s works. The man knows how to write music. After all, I can’t really say Dimension W is bad. Yes, it has plenty of missteps – over the top abilities of the Dimension W, confusing story, not very relatable characters that are underdeveloped at best, also some of them just don’t add anything to the plot. The list continues but some credit must be given to the quite an interesting start of the show and sometimes the soundtrack. Overall rough experimental feel also adds some delicious spice. Still, it looks like the director Kanta Kamei was suited better for Usagi Drop, and that says a lot. If you are interested in the story (well, you probably should be), I believe you’ll be better off going straight to the manga. I can’t vouch for it, but it shouldn’t suffer as much of absence of worldbuilding and overabundance of not that elegant, messy and disjointed storytelling as the anime. Well, at least as a promotion the anime works. Well, I got all emotional and very subjective suddenly. If anyone has forgotten how great anime (in general) is – that’s the very show to rekindle the love for the medium. Doubtlessly Flying Witch will remain my anime of the season (almost) no matter what. Slice of life by definition is a very down to earth genre and to make it as enjoyable as this episode was is an achievement. 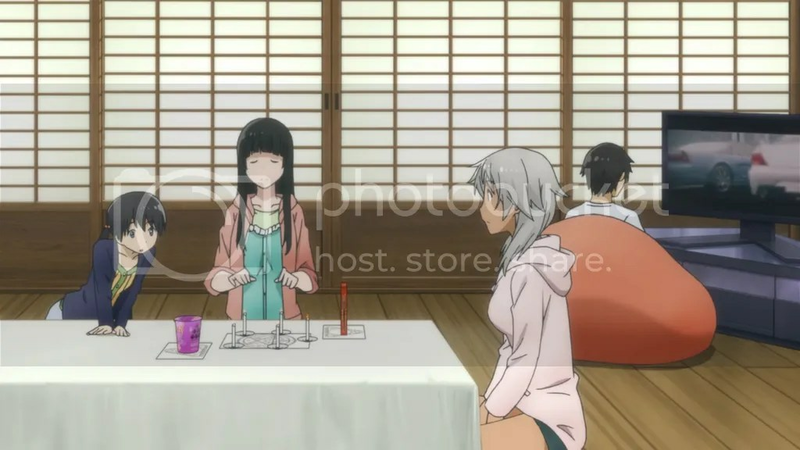 I just don’t have any complaints – music got much time to show its character, transition between the two parts was very smooth, all the jokes worked, Chito-san got a bit of spotlight, a shy character was treated very professionally… All of the main characters from time to time are shown to have some random but very believable personality quirks and even if I can’t include (so far) any of them as belonging to my favorite character list, but together they make one very realistic and endearing cast. Well, I just like this show. Very much. 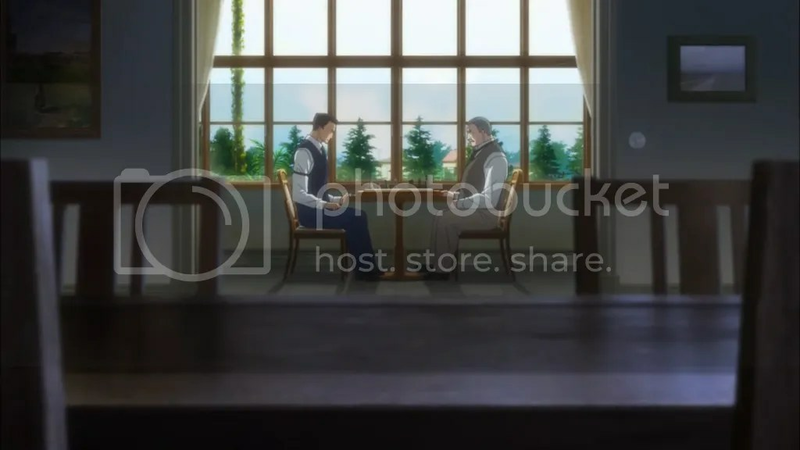 As happy as I am because Joker Game finally showed some signs of escaping episodic storytelling, I can begin to question overall structure of the story. Yes, now it’s still too early to judge, but it doesn’t seem like the wisest decision to have some stand-alone type of episodes between the introduction (formation of the D-Agency) and the other important point of the overarcing story – that is the rivalry with the other spy agency. All those episodes from 3rd to 7th just showed that pretty much all the spies look like brothers and they are some damn good spies. I believe that going head on from the formation of the Agency to the rivalry part would have been better, since if our guys want to come out on top, they have to give their best. This way we would still have seen the point that spies are cool, but the point would have been integrated in the story and not just left floating without much reason. Speaking about this episode – it just worked as an introduction of the other Agency, some typical spy stuff happened and I still can’t say that I care for anybody out of all the characters. 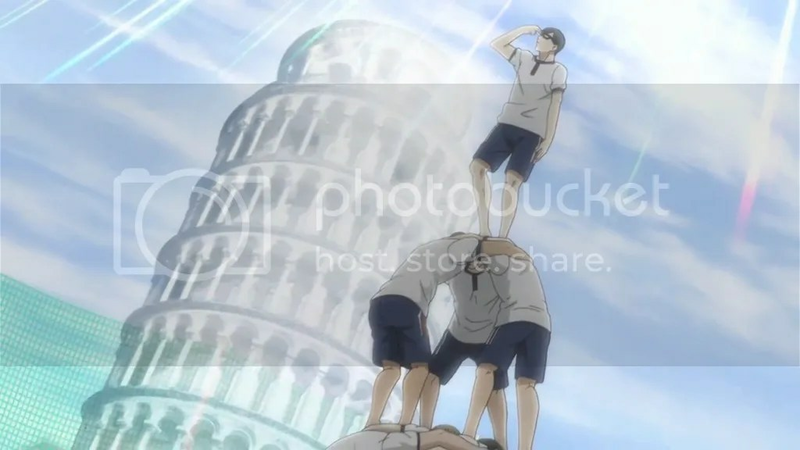 By the way, those chess pieces clearly weren’t the best CG I have seen. A pretty weird episode to be frank – not one Kabane showed up and we even had some sort of a festival. Apparently they still exist in that world. Considering all the plethora of action during earlier episodes, some still water here may mean that everything that’s left will be one huge ride till the very end, with a possible conflict between Mumei’s brother and Ikoma. 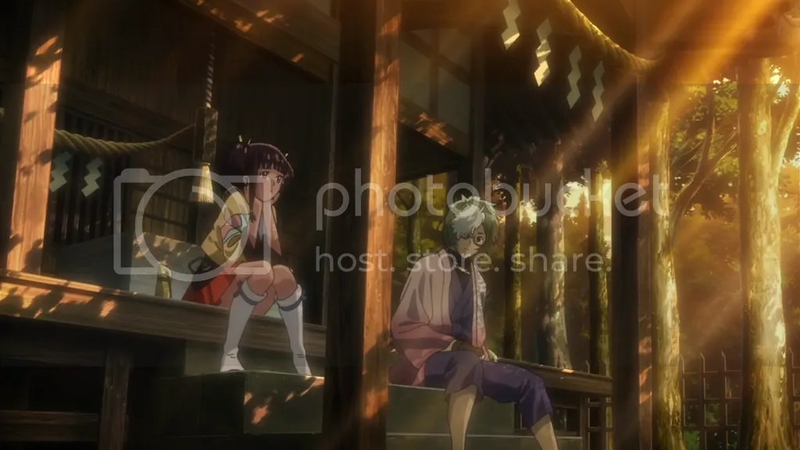 It looks like even if the story is told through Ikoma’s eyes, Mumei is closer to being the main character with all of her complicated history and relationships. The show probably has too much to tell (especially about the whole world, not just the dealings of the main cast) for a one cour. Another thought – Ikoma’s lost a bit of cool thinking. Yes, it’s well and good to think big and dream of reconquering all the land, but is it the least bit possible? 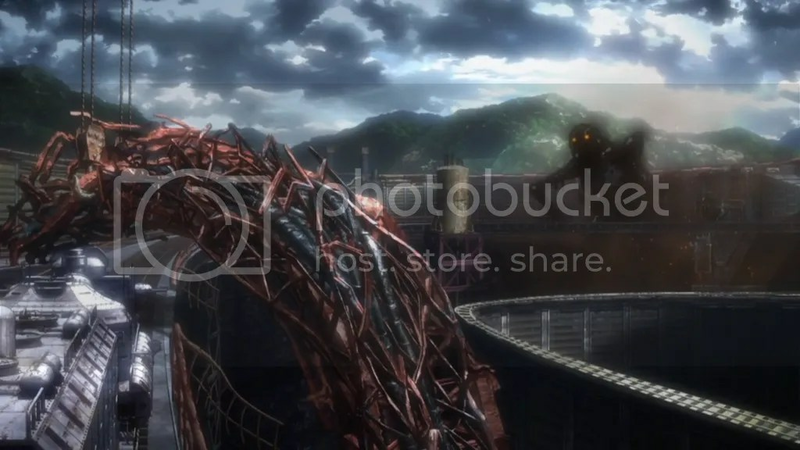 The show itself showed how stations are lost and how do you restore them when some damn titans are roaming around? Well, he may as well be head over heels for Mumei, talking about growing rice and stuff. It’s quite odd to think that some under 18 kids would rather try to rent some juicy DVDs instead of going to some certain sites on the Internet. It appears that the time setting of Sakamoto desu ga? isn’t that contemporary. Anyway, again and again the dude shows how to deal with things, even if it requires some hypnotic abilities (I don’t know how a normal person would have mistaken his drawing for an “Alex” watch). Speaking about ages and appearances of people – it is very interesting how certain shows portray people of the same age – we have to go no further than this show and, say, Nichijou. It’s quite a shock when you notice that both shows happen during the 1st year of high-school. 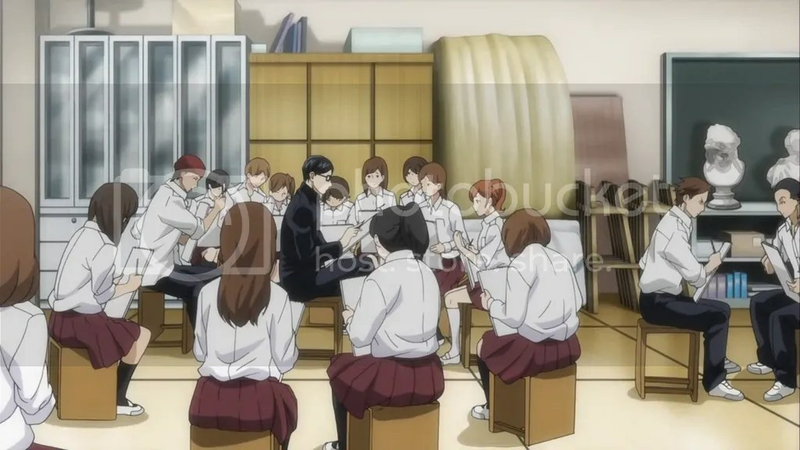 Returning to Sakamoto, the second half used the main guy just as a device to explore a bit deeper theme than usual – sacrificing something for another person, and, albeit it was just a tiny stray from shouting “Sakamoto’s cool!”, it was welcome as something a bit different. Finally an episode about doing magic, not just fooling around. Well, not that I complain. The magic itself was no big deal, but this way it works better with the light slice of life setting – a little and funny spell with a subtle impact, but a spell nonetheless. It may have looked silly, for it was silly, but that’s just what a character like Akane would do while teaching magic. Using Chinatsu as a device to show the trick is a logical idea, since Makoto clearly is on an advanced level, and Chinatsu is as knowledgeable in witchcraft as the audience is. Again the show makes a joke (speaking about the final one) that was coming miles away, but still was funny, and that is quite an achievement. Still, the best thing I can say about the episode is the whole cosy atmosphere in the family. Everyone trusts each other enough to be themselves and just make up a very believable ensemble of happy cousins and siblings enjoying their life. I’m slightly surprised how a single episode with pretty basic characters managed to be impactful after all. 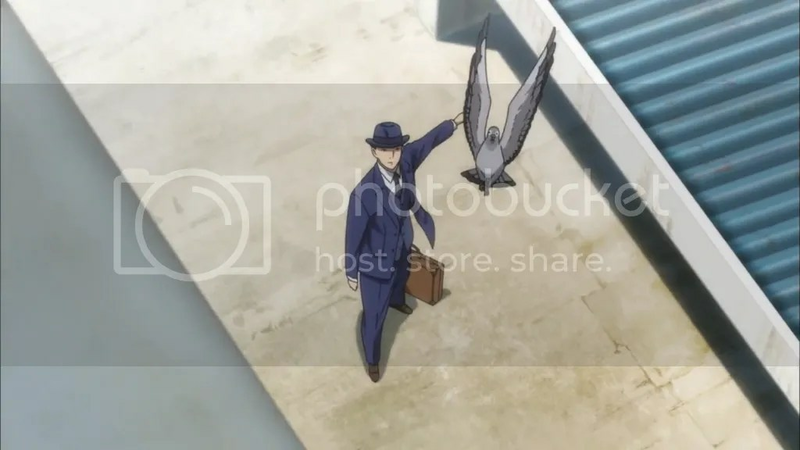 Joker Game can be a good show when it wants to. There were episodes in the past that featured quite tragic characters, but I’m not even sure why especially this one just struck into the right place. Maybe it was some Enigma references, maybe for once there was a clear outdoor setting, or just the girl was behaving very childlike. It just worked. Well, if I’m to nitpick, there are some details – like recognizing a person (who’s definitely no elf) from his ears or just a clearly loving mother abandoning her child so easily. Yes, she’s guilty, but how would anyone find that out? Maybe she’s afraid that she would blurt out her being a spy anyway, but entrusting her girl to a complete stranger just doesn’t sound like a very motherly thing to do. Week after week Koutetsujou no Kabaneri remains the most stunning visually of all the shows I watch this season. Not to underestimate other aspects, but everyone at Wit Studio clearly does his/hers best. After such episodes I think it’s no strange thing that Attack on Titan got delayed. It’s quite amazing how even the CG is pretty well made. 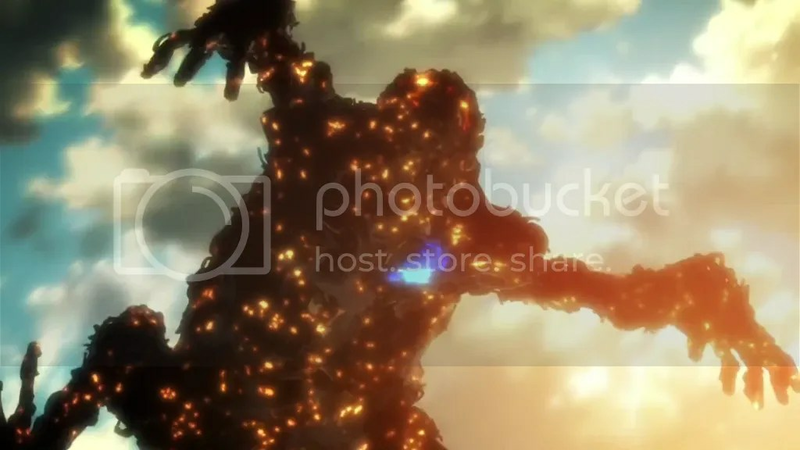 Yes, there is that shounen element when heroes get almost crushed by stones and even mention that it hurts or get almost eaten by Kabane (also, weird that Kabane didn’t bother to finish Ikoma off) and after some 15 minutes jump around energetically like nothing happened. Yes, they are supposed to be able to recover quickly, but come on, how quickly you can recover your stomach that’s eaten through? Also, I’m not sure how Ikoma always gets away so easily with a gun that can counter only one Kabane at a time and it takes time to aim and shoot, while during that other Kabane can pretty much devour him from head to toe. Still, the fight was very good looking, Mumei looks like she learned her lesson, what else could I wish for? First thing I noticed – the music this time was just spot on – both marching theme and slower and subtle melodies during the second half really improved the episode. Speaking about the stories, they were nothing exceptional considering what we have already seen – just usual mildly amusing and not too boring stuff. Somehow this time stories felt a bit more personal and therefore a bit more enjoyable. 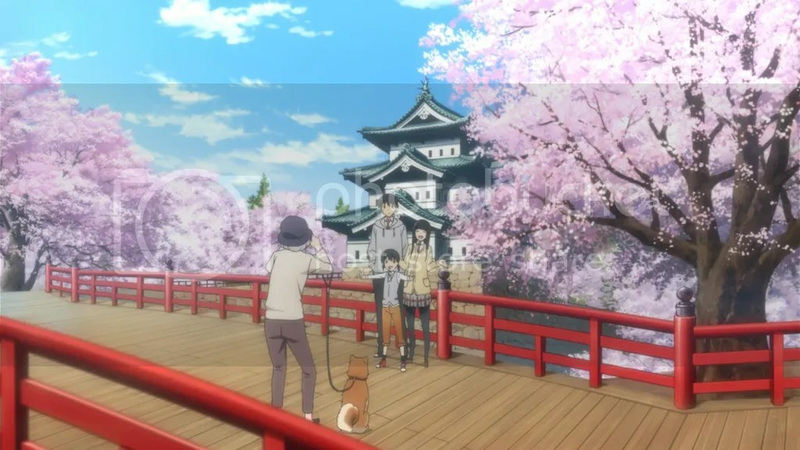 However, when the girl was showing her photos to convey the ghost’s feelings, her photos managed to change their orientation with a guy next to Sakamoto appearing in them (or not) because of that. Also, Sakamoto’s writing after the credits was in a pretty broken Engrish, if I read that correctly. So he does have a flaw after all! Well, overall we just saw more inhumane feats of the guy and I’m pretty content, even if the show doesn’t feel like the best comedy ever. Well, the episode this week could easily stand for a definition of the slice of life genre. 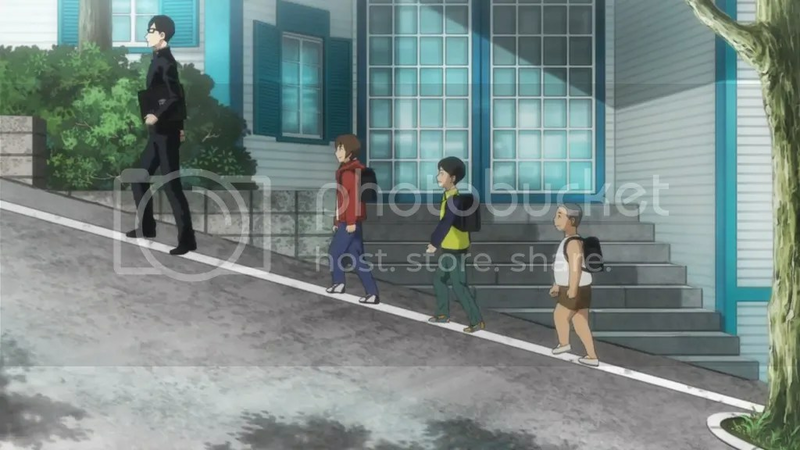 The whole time was spent just tracking Chito-san, walking, observing surroundings, walking again and just doing nothing. I can’t say that it made the most exciting time of the week, but as a random laid back experience it wasn’t bad. Yes, I would love to get more story and I probably will, since there are still some characters in the OP that are to be introduced and all of already introduced ones still haven’t been explored that much. Akane slept through the whole episode and I really can’t blame her. Still, I can only applaud the cat-ness of Chito-san, from his walking style to climbing trees or going around in a circle thrice before finding the best position to roll for a nap near Chinatsu. He may not have the voice and more edgy personality of Sakamoto-san form Nichijou, but well, I just can’t escape noticing their similarities. It’s not that often to see a cat that genuinely feels like a character. I’m more content with this episode than the last one, and the story seems more interesting and engaging, but some things just appear to mar overall enjoyability. Speaking about flaws, I doubt it’s so simple to keep an alive pigeon hidden in your jacket (even so when the costume looks just perfectly sewn for a lean guy) unless the spy is missing a few ribs. Not to mention that pigeons just love to leave plenty of droppings everywhere. Having your safety depending on one little bird that can be lost or just killed very easily doesn’t seem that reliable. 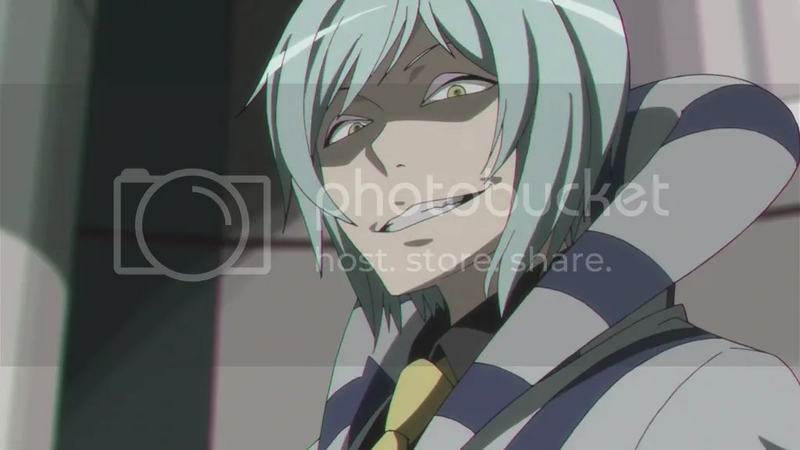 And one last thing – why would the conductor after the assassination change into some civil clothes and after some time change back again into his uniform? Apart form all these things and a strong wish to have known all the characters better, somehow I find a strange pleasure in the Japanese’ thwarting some plans of the Soviets. I guess the fact that the Soviets had done some nasty things to my country transcends even to the enjoyment of an anime. …And I just don’t know how to take that ending. Attack on Titan (Made of Zombies) now really looks like a decent alternative title for the show. Somehow the episode felt a bit like a slice of life – nothing that important happened, but I feel pretty content about that. Yes, the crew needed to clear another obstacle, Mumei again behaved not that refined, and that pretty much is it. 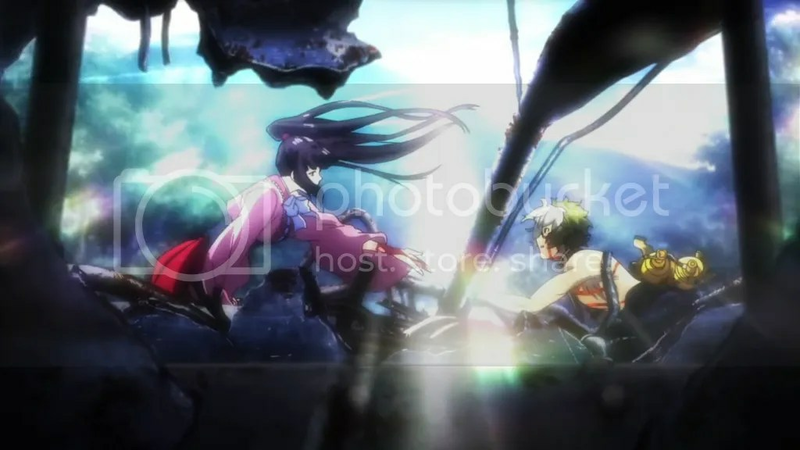 Somehow I’m troubled how Mumei looks to have immense martial ability but fails miserably in the psychological field, while Ikoma, who still may not have grasped all of his new abilities and stuff that being a Kabaneri comes with, feels a lot more grounded and just knowing what to do. It appears that Mumei (as probably everyone else) has some dark past that turns out her brain off and enhances her stubbornness just to prove what she’s capable of while caring not a fig about feelings of the others or just simple and pretty logical thinking. Of course, this provides a huge possibilities of growth, but the series must do something more to make Mumei not just an arrogant fighting brat. First, structurally there could have been some wiser choices made, as now the main story spans more than half of the time but less than a full episode, and other little sketches before and after it doesn’t make much sense and looks like they were put there just to extend the episode to the normal length. Apart from those filler-ish things, I quite liked what Sakamoto desu ga? had to show this time. Even if “lending a face” doesn’t sound that natural in English as it probably does in Japanese, the joke as well as others (especially that one with the teacher’s haircut) were some decent grinning material. Mr. 8823 himself was shown to be more complex character than just a typical king of the delinquents, having some honor and respect for others that can at least be a fair match to him. Was the episode ground-braking? No, but it was entertaining enough and probably one of the better ones of the series. First and foremost – the scenery is damn beautiful. Every sakura petal seems to have received a special treatment, and it perfectly accompanies light, cheerful and relaxing mood of the show. While previous two episodes were made of two unrelated segments each, this one tells one cohesive story, and I think it’s for the best. 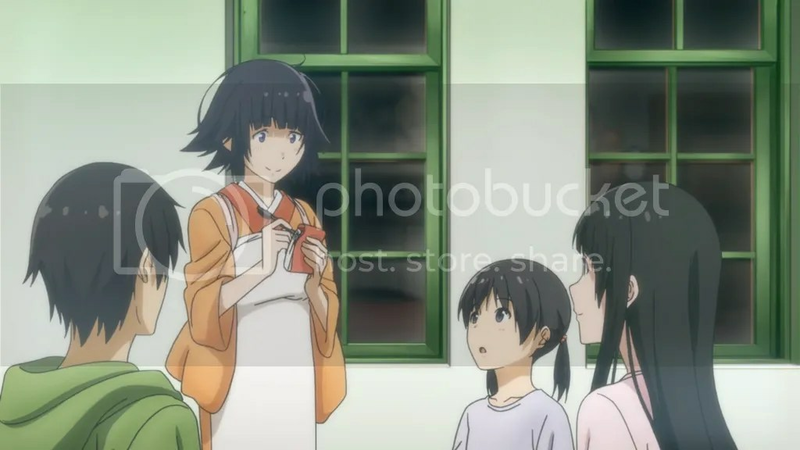 Yet another character is introduced, but this time she shows more personality than the other two did in their respective episodes and the series also manages to include Akane, Makoto’s sister, again, which helps the show’s cohesiveness. 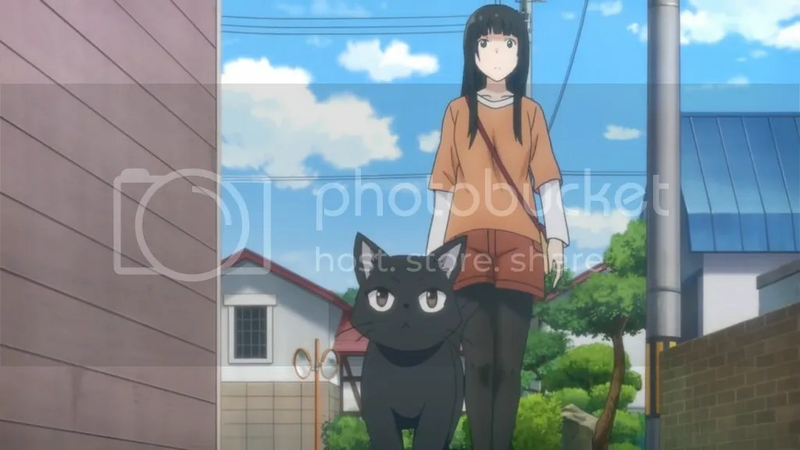 Flying Witch achieves just the right balance between the viewers’ interest about the new girl, some pretty random (or sometimes expected, but that’s not necessarily a bad thing) jokes, eye-catching surroundings, warm interactions of already familiar characters and some little insights into their personalities and, of course, some pretty half-baked magic, that provides probably my favorite scene after the mandrake from the first episode. Well, I just can do nothing but like the show. Again an episode with pretty much no one to be called a character even marginally. It’s not a new thing in the series, but this time the story itself wasn’t that unique and interesting, so some other not so shiny features were a bit more apparent. There were some instances of not that believable outcomes in the past, but this time coincidences were pretty hard to stomach for me. I doubt anyone would feel safe to bet that an escaped spy would randomly find just the right door when he just seemed to have come to a dead-end. Not to mention that apparently no one bothered to question why a certain door in the citadel of spies has such an obvious marking on it. And if that’s not enough, a certain double agent came to the rescue just when he was needed. After that, I’m not even impressed that he managed to get to search the exact corridor and do that alone. Who sends searching for a dangerous person solitary men in the first place? On an unrelated note, the show used to portray characters quite realistically. That is, until now. 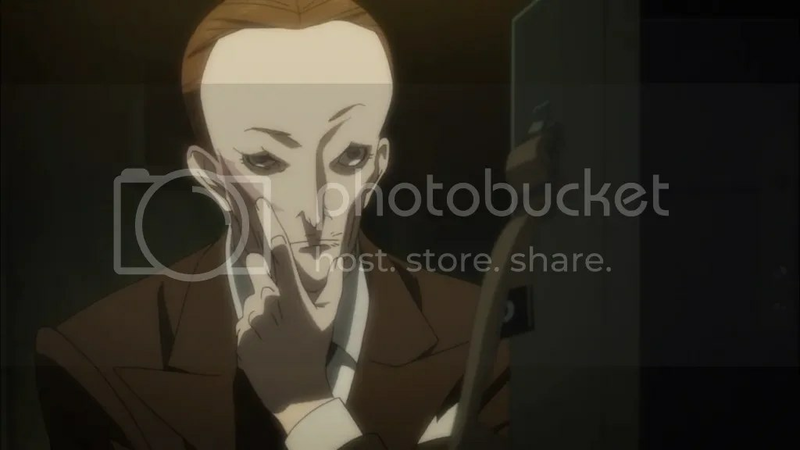 Who came with an idea to have such a deformity of a character design that the English spy-daddy is? 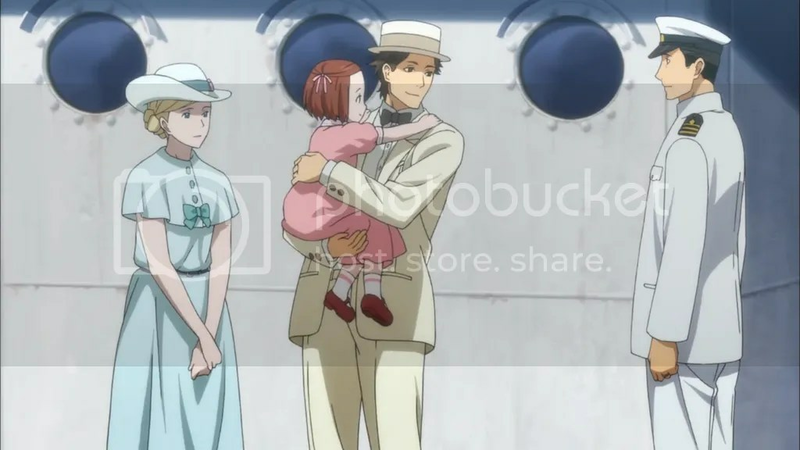 I guess, Joker Game can be blamed for many things, but some of them came from the source material (and its type) and there’s nothing to be done about it, for better or worse. Well, nothing too impressive in the story department this time. Looks like everyone finally decided that Kabane and Kabaneri are pretty different things after all and the latter are worth to have at least some faith in. To the whole taxonomy of Kabane and their like a sword-wielding (and not badly) type was added. I won’t be surprised if it’ll turn out to be an intermediary species between Kabane and Kabaneri. The ending of the episode looked as if it could be a half decent ending of the whole series. Does it mean that a new arc will start? Possible, and it wouldn’t be too unwelcome. To be frank, the episode may be memorable only for a nice OST and fighting scenes that probably is the best thing Wit Studio can offer. However, albeit animation was nice, I think a bit fewer camera movements and choreographic feats for the sake of them would have made the scenes more immersive. Still, more times than not I can’t complain. I guess for me the show has already showed pretty much everything it could. I appreciate that all the stories (this episode and other ones) manage to differ from one another and achieve the ending by various sometimes really original and amusing ways. Nonetheless, the end result is always the same and, to be frank, after 4 episodes of it I’m feeling a bit tired of that. Well, I think I remember pondering the same thing about the manga, and even if many details escape me now, the story with Hayabusa (that is, the content of the next episode) was somehow different in a good way. Considering another topic, the OP seems to have been growing on me. I guess I just like that artstyle and music that progresses very randomly, but, of course, in a cool way (pun intended). Suddenly I got an urge to relisten both of the Nichijou OPs.